Most user-friendly applications use wizards to step the user through difficult or critical tasks. Such a task may, for example, install software, create a user account, or export data to a file. Wizards make these tasks easier by requesting one piece of information at a time rather than overwhelming users with all information at once. In addition, wizards often give users the opportunity to verify their input, which leads to fewer errors and a more enjoyable user experience. The core Java libraries do not provide high-level support for wizards. As a result, developers either implement their own wizards or resort to using an overcrammed traditional dialog. The Wizard Library provides a framework for which to create wizards. It leads to a common appearance and behavior not only within an application but also across applications. By default, the wizards in this library follow the guidelines set forth by the JavaTM Look and Feel Design Guidelines: Advanced Topics by Sun Microsystems, Inc. The Wizard Library does not provide content for the wizard’s pages. It is not an application that generates wizards for you, such as InstallShield or InstallAnywhere. Rather, it is a general-purpose library that allows you—through programming—to create wizards for any task. You can certainly use it to create an installation wizard, but it is your responsibility to provide the appropriate page content and wizard task. Before you start using this library, you should download and include on your classpath the jar file of the Java Look and Feel Graphics Repository. It is available free-of-charge here. Without this resource, your wizards will not display any button icons. The side panel, if one exists, is often a graphic, a list of steps, or a textual source of additional help. For more information on the side panel, see Side Panel. 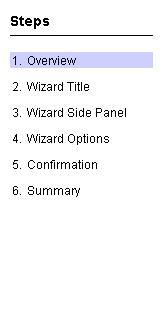 The page panel is the editable area in which the user inputs information needed to carry out the wizard’s task. 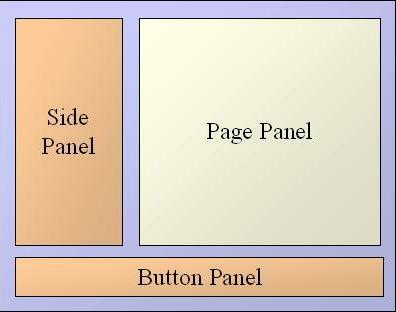 The wizard model provides the content of this panel, which changes as the user steps through the pages. For more information on the page panel, see The Wizard Model and Wizard Pages. The button panel contains navigation buttons (such as Next and Back) and action buttons (such as Finish and Cancel) that allow the user to control the wizard. For more information on the button panel, see Buttons. Although an instance of JWizard can be placed in any container, it typically appears in a standalone dialog. The following code snippet demonstrates a typical use of a JWizard object. The value returned from showDialog indicates if the wizard finished successfully. When sizing the dialog, the layout manager tries to respect the side panel’s minimum and maximum sizes. If you do not explicitly set this accessory component or if you set it with null, then one of two constants determines what to use in the side panel. Do not use a side panel. Include a side panel that displays a list of the wizard’s steps. The actual steps displayed in the list are fetched from the wizard model. For more information, see The Wizard Model. To hide the side panel, you must ensure that the accessory component and default accessory are set to null and DEFAULT_ACCESSORY_NONE, respectively. The wizard model controls the sequence of pages in the wizard. It has several responsibilities. Not all actions are available at all times. The following methods state whether an action is available. Third, the wizard model maintains a state. 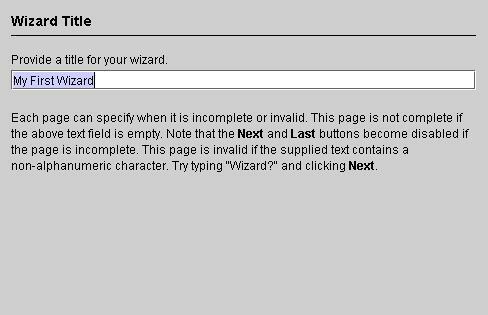 If the wizard model is gathering user input, then its state is WIZARD_IN_PROGRESS. If it is in the middle of executing its task, the state is WIZARD_FINISHING. When the task completes, the model moves into a state of WIZARD_FINISHED. If at any point the model is aborted, its state becomes WIZARD_CANCELED. The Wizard Library provides one concrete implementation of this interface: DefaultWizardModel. The DefaultWizardModel class is a generic, domain-independent implementation that should prove sufficient for most needs. It can handle both static and dynamic page sequences, execute an arbitrary task, show a progress page, and show a final summary page. DefaultWizardModel maintains a list of pages and allows the client to iterate through these pages until it reaches a page that you have denoted as the last page. At the last page, the finish action becomes enabled. If the client invokes finish, the model executes a task that you have supplied and advances to the progress and summary pages. The use of DefaultWizardModel is described in detail in the following sections. Since wizard tasks are application specific, the Wizard Library does not provide a complete implementation of Task; however, it provides AbstractTask to simplify the creation of your task. When you subclass AbstractTask, you need only provide an implementation of the run method, which executes the application-specific code. As your task executes it should invoke setProgress as often as possible to notify listeners that its progress has changed. A time-consuming task is user-friendlier if the user can interrupt it in mid-execution. If your task can handle interruption, you should override isInterruptible to return true and periodically check for interruption inside run by invoking shouldAbort. Pausing and resuming are handled by AbstractTask. push is the same as addLast except that it removes all subsequent pages before appending the new page. In the first method, you will typically add pages, update the last page, and update the finish task as appropriate. In the second method, you will typically remove the pages that you added in the first method. The following example illustrates the use of a transition. The transition uses the selection of a radio button to determine the subsequent pages. Although it is the developer’s responsibility to populate the wizard model with pages relevant to the task, the library provides two concrete implementations of this interface: OptionPage and ProgressPage. The former is a generic page that can display any information, while the latter shows the progress of the wizard’s task. We describe each page in detail in the next sections. The method getEditorComponent takes a page and converts it into a graphical component to be rendered in the wizard. The page is in the state of being edited until an invocation of either cancelEditing or stopEditing occurs. The latter method commits any changes and validates the page. If the edited page is not valid, the method returns false. OptionPage is a generic page much as javax.swing.JOptionPane is a generic panel. An instance of OptionPage consists of a name and a message. The message may be of any type. DefaultWizardModel uses a progress page if you have supplied a finish task and have called setProgressPageIsUsed with true. The model constructs a page of type ProgressPage, which ultimately gets rendered with a ProgressPageEditor. In most cases, you will not need to concern yourself with this page. You simply must decide if your task is long enough to warrant a progress bar and invoke setProgressPageIsUsed. By default, the progress page editor stops the task immediately when the user hits the Stop button. To bring up a confirmation dialog, however, you will need to subclass ProgressPageEditor and override confirmStop. The amount of space the side panel should occupy, as a percentage of the total width. The UI will honor this percentage unless the maximum and minimum widths of the side panel and button panel do not allow it. A mapping of keyboard events to action names. The preferred height of a wizard dialog. The preferred width of a wizard dialog. The wizard’s foreground color. Page editors may use this value to initialize page components. The wizard’s font. Page editors may use this value to initialize page components. The UI uses this font in its default side panel. The background color of the side panel that contains a list of wizard steps. The font used for wizard titles. Page editors may use this value to initialize page conponents. The UI uses this font in its default side panel. We put most of the ideas discussed above into a complete example, called WizardDemo. The program uses a wizard to step you through the creation of your own wizard. The first wizard illustrates the use of a static wizard model without a finish task. Your custom wizard illustrates the use of a dynamic model with a finish task, a progress page, a summary page, and a Help button. You can run this sample application on the library’s homepage.